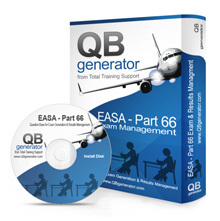 QBgenerator is a computer programme that is offered to training organisations who wish to set exams for their students, either as a part of an EASA Part-147 approval, or simply to set practice and mock exams for the EASA Part-66 courses. The programme stores an unlimited amount of multiple choice questions and essay questions, sorted into Part-66 syllabus modules and sub-sections, and graded into Levels as specified in the Part-66 rules. You can set administration levels for access, based on who is authorised to add/edit questions, and who can only generate exams. Exam generations are highly configurable, you can select the module, the sub-sections, the number of questions and the Licence Category, or simply select "Part-66" format to generate an exam of the same format as the Competent Authority would issue. Exam papers are generated randomly (i.e. questions are selected at random with the constraints specified as described above), are printed onto paper, and include a blank answer-grid sheet, and an instructor's copy. Questions are fully editable, with the ability to add diagrams if necessary. You can add new questions, copy / move existing questions to other Modules. "Online Mode" lets examinees do paperless exams at computer screens (including tablets) with automatic marking. Provides question "Facility Index" statistics. Print Exam Reports and Examinee Reports. The QBgenerator comes with over 7,000 'stock' questions loaded by default. However, you can either enter your own additional questions (if you have them already in some electronic format, such as MSWord), or we can supply more questions (up to 20,000 multiple choice 'stock' questions are available across all Part-66 modules, or 'secure' questions), at an additional cost. If you are a training organisation, perhaps you are a Part-147 approved organisation, or are preparing for such approval, and if you are looking to facilitate yourself with a Part-66 exam bank and question generator, please feel free to contact us by email or phone for an informal discussion to discuss your exact requirements. We can provide a full system demo either by visit, or via Skype. See qbgenerator.com for more information.